The ultimate cookbook by America's most famous culinary master, the companion to his final PBS show. 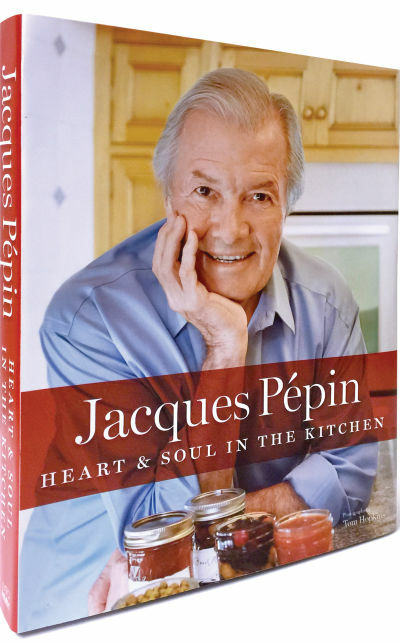 Jacques Pépin Heart & Soul in the Kitchen is an intimate look at the celebrity chef at home with family and long-time friends presenting the food he cooks today — 200 recipes in all. Here are the simple dinners he prepares for his wife, like the world’s best burgers (the secret is ground brisket) or broiled sole with chive butter. Here as well are elegant dinners for small gatherings, which might begin with tantalizing starters, like Camembert cheese with a pistachio crust, and conclude with foolproof little chocolate soufflés that can be prepped in advance. Then there are dishes for spirited pétanques parties in Jacques’ backyard, with dishes like grilled chicken tenderloin in an Argentinean chimichurri sauce of cilantro and scallions. This book shows the many sides of a man who has always been ahead of his time. A proponent of the nose-to-tail eating that is currently popular with young chefs, Jacques includes recipes for choice morsels like calves’ liver and lambs’ tongues. An unabashed lover of the supermarket, he demonstrates a magician-like knack for using convenience food to make impromptu feasts for drop-ins. A locavore long before the word was coined, he shares recipes for the bounty he forages: dandelions, ramps, nettles, tiger lilies, rose hips, locust blossoms, and many varieties of mushrooms, not to mention periwinkles, crabs, whitebait, and more from the nearby ocean. Spiced with reminiscences and stories, Jacques Pépin Heart & Soul in the Kitchen reveals the unorthodox philosophy of the man who taught millions of Americans how to cook, revealing his frank and witty views on everything from molecular gastronomy, to memories of Julia Child and James Beard, to how he creates recipes, to how to raise a child who will eat almost anything. Illustrated with Jacques’ watercolors and more than 100 full-color photos of the food and the chef in his element, this is a must-have cookbook.